The Renaissance was a time from the 14th century through the 16th century, when historians say there was a great re-interest in learning. People began to question and come to their own conclusions about things around them and stopped believing just what was told to them. Ideas of the ancient Greeks and Romans were "rediscovered" during this time. A movement called "Humanism"began during the Renaissance,believing that people should be able to think freely, have curiosity and discuss thoughts with others.Astronomy, biology, math, botany(study of plant life) and the human body were studied. Just like the ancient Greeks and Romans, people during this time began to believe that laws were to be made by people and could be changed by people. People also thought that literature and art could be for enjoyment and not only for religious purposes. 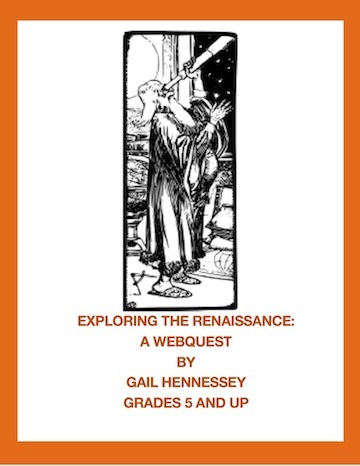 Use this webquest to learn more about some of the people that lived during the Renaissance. Try writing backward as DaVinci did. Pretend to be one of the people of the Renaissance highlighted in the webquest and write a day in your life. Include 4 facts learned. Draw the Mona Lisa or Pieta. Write 5 facts ,in complete sentence form, learned about the Renaissance. In the complete resource,there are 10 questions filled with lots of information. There are 14 extension activities, comprehension questions, resource links and an answer key.I really think you will find this resource of value!